Just about every martial art, traditional or non-traditional, has weapons defenses or techniques. So why do most martial arts train them in such different ways compared to how we train empty hand techniques. So whether we like it or not weapons are a reality of the societies we live in. Whether you live in the safest area of town or the worst part of town you could find yourself being attacked by someone. In most cases the person who is going to attack you on the street will feel like they have some kind of advantage over you to do so. They are going to have the confidence to attack you and feel like they can dominate you and control the situation. They are going to have this sense of confidence and advantage in one of several ways. They will feel that they are much bigger and stronger than you and can use this to overwhelm you. They may have another person or several other people to help them to give them an advantage of numbers. Or they are going to have a weapon like a knife, bat, screwdriver, machete or a gun. Who knows, there are lots of potential object and tools that can be used as a deadly weapon. So with this in mind how well are we prepared to defend ourselves against these potential threats. Granted you should always do whatever they are requesting of you in terms of giving them a wallet/purse or piece of replaceable material things. DO NOT escalate the situation if you can simply give away something as meaningless as money to a drug addict or thief and go home alive. What we are talking about here is an attack that comes unexpectedly or one that comes after you have already complied and now they want to kill you anyway. For this article we are going to look at just dealing with a knife and break down how to train for this. We need to have structure to this the same way we have structure in everything else we train in the martial arts. First we need to learn some basics. These basics are the techniques that we see almost every system of martial arts do. You need to learn what to do when a knife comes at you in almost every possible angle and what you can do from there. Unfortunately this is also where most martial arts stop the knife training, and say that they know what to do and are prepared to deal with it. This is only the very beginning and basics. Once you have a sense of what to do it needs to be tested like you would anything else. We learn basic hand techniques to deal with certain strikes and then we drill them and eventually we free spar and try to use the techniques against someone who is really attacking us. So the individual techniques needs to be drilled over and over until the student can do it without thinking about it. The drills are being done while his partner is allowing him to practice by giving him a certain type of attack. This is the same way any school trains techniques to get it in the muscle memory. Once a student has a toolbox of techniques that have been drilled they need to put them to the test. The next phase is to have a training partner come at you full speed and power at random with a single strike. This allows the student to begin to train for the reality of force from an attacker trying to cut or stab them. This too needs to be drilled over and over until you can react appropriately and not get stabbed or caught by one of the strikes. The last Phase needs to be full contact and power, or free sparring with the training knife. Students have to learn how to close the gap, evade a strike and properly position themselves to control the attacker using a mixture of the basic techniques they have in their toolbox, or at least the basic principles of these techniques. This training is the same whether you are on your feet or on the ground. Also, we need to train these types of attacks against more than one person at a time as well to be able to understand how to create space and control a deadly attack from several people with weapons. You may feel somewhat confident after training weapons defense and disarms on your feet but what about on your back with someone on top of you. You can be the best grappler in the world, but if the other guy has a knife you are at a serious disadvantage. A knife can be passed from one hand to the next and easily plunged into the body while you are focusing on a joint lock or choke. We need to train these situations and be prepared to fight to survive. So at the end of the day we as martial artists can ask ourselves one thing. Are we prepared to handle someone attacking us with a weapon? Are the martial arts we are studying preparing us to deal with a raw and overwhelming attacker who is determined to kill us, our someone we love. What a shame to train our whole lives to only be a victim if and when an unfortunate attack should happen to us. What is MMA? Simply put MMA is shorthand for Mixed Martial Arts. But what does that mean really? Is this a new concept that developed after 1993 when Royce Gracie dominated the UFC with Brazilian Jiu Jitsu and the martial arts world adapted this into their perspective styles. Is it when Helio Gracie developed Gracie Jiu Jitsu which was taught to the Gracie family from Mitsuo Maeda. Perhaps it was when Maeda trained under a top student of the founder of Judo, Jigoro Kano. Looking even further maybe it was when Kano learned Japanese Ju Jutsu which was the primary throwing and grappling portion of an even earlier art called Aiki Jutsu. Where do we then say this system or that system is a mixed martial art or not. Looking into almost every style of martial arts across the world we see the same patterns of outside influences. Looking into the Karate styles for example we see that Okinawans learned fighting technique from the Chinese which most believe was the influence of White Crane Kung Fu styles. 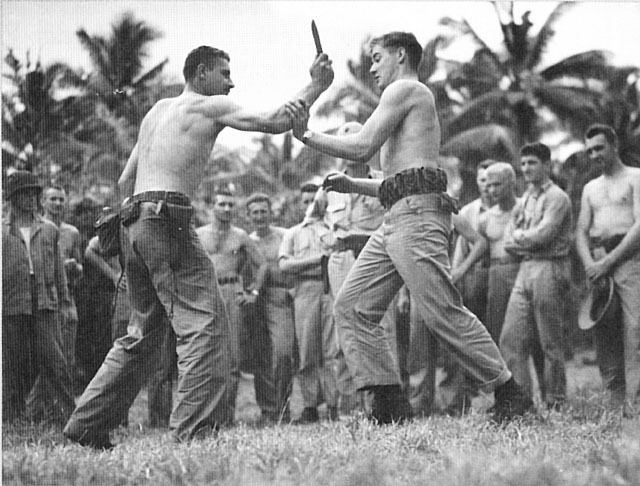 The Okinawan techniques were then refined and made to work for them as individuals and became proudly an Okinawan traditional martial art over time. Later the Samurai came to Okinawa to take control and Okinawans had the opportunity to not only use the art but also inadvertently show it to mainland Japan. The Samurai who had to fight against them were impressed by the skills they encountered. So we now see where Samurai fighting arts are incorporating Okinawan Karate into their system because they found it was useful. Many other styles like Shotokan and Kyokushin Karate later formed from this influence. Also to note we also see the creation of styles like Aikido which was founded by Morihei Ueshiba who studied in the same Aiki Jutsu arts as Jigoro Kano. Yet they both created two very different systems of martial arts. In contrast styles like Taekwondo also developed from Shotokan Karate but today looks completely different. Chinese Kung fu is no different or better in the same regards. Looking at my own style of Choy Lay Fut Kung the name itself is honoring the three different teachers that the founder learned from. The system was founded in 1836 by Chan Heung who studied under three different teachers. Each teacher taught him a certain aspect of Kung Fu which he was able to mix together in a cohesive way to make a complete fighting system that worked well for him. But even so as history went on some of his students, most notably Tarm Sarm, created unique lineages of Choy Lay Fut that had a different look and focus all together from what the original system may have been. When we really look at what it means when we call something a mixed martial art what we need to actually realize is that it is simply an evolution of a style or system that is being influence or tested as time goes on. The sole purpose for martial arts at their core is to protect and defend yourself. So naturally if you have been doing something for many years and all of a sudden somebody comes and dominates you in a challenge match with something you have never seen before, you would want to learn what they have and incorporate it in your system in a way that makes sense. When I see MMA in the media and I hear people say they study MMA it’s good to observe and understand what it is that they are doing. They are not reinventing the wheel of martial arts. They are simply taking styles and techniques that have been evolving for many years and making them useful for the application they are using them for. In most cases “MMA” as a “Style” is used in the sport context so they need their techniques to be geared towards that environment. But say 700 years ago in mainland Japan, what your MMA needed to be good at was using a sword to quickly cut a man down and survive during a challenge or real combat situation. The notion of doing anything other than studying the sword or archery was complete nonsense. This also applied to a lot of empty hand combat as well considering you always carried a sword. MMA or Mixed Martial Arts have always been with us and will always be with us. We need to embrace it as a natural part of the life cycle of the martial arts. We need to remember that we must flow with the notion of MMA and not against it. I think the article highlights in many ways the reasons why traditional Kung fu has had a hard time claiming its stake in the modern world of martial arts. The article seems to make the case that the older masters feel that there are not any students worthy of learning their style and dedicating themselves to becoming proficient. To me it is almost the opposite as to why Kung Fu is not thriving and growing in comparison to many of the popular martial arts systems that seem to be. There are many dedicated individuals out there now studying many different systems of martial arts. They have the drive and dedication to push themselves and train day after day for the long haul because they have made it a part of their lives. A great example of this is the non MMA Brazilian Jiu Jitsu community. The students that study this art are extremely enthusiastic and dedicated to training the techniques of BJJ. They go train everyday and know that the path to a black belt can take at least eight to ten long, hard years. But they don’t care about the belt. They embrace the belt that they are at. It’s about the journey and not the destination. They are there to learn and test themselves in the martial art that they are being taught. They stick with it not because they are told it is effective and practical but because they get to see for themselves. The way I see it is this. If the truly qualified Kung Fu teachers out there who know how to apply the art would openly teach it and show the students the effectiveness of the style, it would have plenty of dedicated students eager to keep training. Unfortunately what I feel has happened is the unqualified “Masters” have hidden behind the wall of saying they don’t need to test themselves and are worried they may lose face if they do. So these poor quality teachers say they will only show the application or fighting portion to those that have to work endlessly for years doing something that will not prepare them to protect themselves. Since they truly don’t understand how to use the art they lead on their students until they get discouraged and move on to something that they see has real life application to it. When a new student is being taught a long form or some hand movements but are not being taught how they work for self defense it does not motivate them to dedicate themselves to the long hours of practice. It’s tough for Kung Fu practitioners because we have a lot of tradition and history that we hold very dear to our hearts. But we have to not get carried away and create an unrealistic tradition that forces the arts to fade away. Some of these traditions are not even true for the most part, or they have been fabricated by 70’s Kung Fu movies that have perpetuated an almost superhuman fantasy about the effectiveness of its practitioners. There is no magic to Kung Fu, only blood, sweat and tears. Something that I have been discussing a lot with my fellow Kung Fu brothers and students is, we need to maintain our traditional system but make it relevant. People need to know that what they are learning can go toe to toe with any other style and have a fighting chance. It is up to them to train and push themselves to make it work. We can’t rely on stories of old masters winning challenge matches so therefore our style is proven. We need to test it and keep proving it for ourselves to ensure that we are not drifting off the path and becoming a secretive society that won’t allow a friendly sparring match. I wasn’t always as passionate about health and fitness as I am now. I can clearly remember a time in my life when running was something only to be done in the event of a zombie apocalypse or alien invasion and even then, only sparingly. Then, one day while sitting behind the counter at my friends comic book shop having an inappropriately good time with a carne asada burrito, things changed. An old friend of mine from school, who I hadn’t seen in years, walked in and was talking about learning Kung-Fu, some weird damn thing called Choy Lay Fut. I listened intrigued and agreed to meet up with him and another guy later that week in his garage and train. Thus the wheels were set in motion. I trained hard for many years and in the process began to develop a passion for hurting myself. I was hell bent that if I wasn’t bruised, bleeding and sore I wasn’t doing it right. In the early days I would go to the gym for a couple hours before work 5 days a week then go to train with Sigung Primcias 3 nights a week for 2-3 hours. I maintained this for awhile, but like any human, life happens and I settled in to a more sustainable rhythm, however at no point in here did I ever really stop to listen to my body. My philosophy of ignoring pain and pushing beyond my limits, while motivating and strengthening to the development of will power, isn’t so hot when you actually hurt yourself. Furthermore, I never really spent the time to link together what I was doing in the gym with what I was doing at practice. It’s like the two somehow maintained this mutually exclusive space in my head. Looking back on it now, I struggle to see how me bench pressing 280 lbs. was in any way helping my Kung-Fu. All the same, I pushed and pushed and ignored until my body finally snapped. A couple of years ago I severely ruptured the L5/S1 intervertebral disc in my spine while training. At that time, my modus operandi was still, ignore pain and push through, which was the worst thing I could have done. I spent the next 9 months in agonizing pain barely able to walk. To say it was unpleasant is akin to saying Godzilla is just a misunderstood salamander. In the process of recovery I was getting an acupuncture treatment to attempt (unsuccessfully) to resolve the issue. The acupuncturist also just so happened to be a Wing Chun practitioner and we got to talking. He made the remark “Well, it looks like you’ve done a great job building really, big, completely useless muscles.. so how’s that working for ya?”. Feeling a bit stupid I had to admit that I hadn’t really been doing a good job of actually thinking about what I had been doing and how it was all working together or really taking care of myself in the process. I spent the rest of my recovery time thinking about how I could change this. Following spine surgery I put my plan into action and not only successfully recovered but managed to, PAINLESSLY, get myself in better shape now, at 38 years old, than I was when I was killing myself training 15 years prior. I am faster, have more endurance and power than I ever had then and I believe it is largely due to the fact that I reorganized my non-kung-fu training to support my body better. Considering how the body synchronizes during certain common/repetitive motions performed in the process of training got me thinking. A punch – simple right? Hitting something with your fist, not too complicated. Wrong. There is a symphony of body mechanics that are called into action when you punch properly. You start with proper form and footwork, rooting yourself and directing energy from your feet pushing forward, up your legs and into your hips as they whip forward while keeping your shoulder and arm loose until the moment of impact. All of these motions from simple punches to the most complex footwork and kicking requires the various muscle groups of the body to work as a unified team. Why had I not been taking this into consideration before? I decided that standard gym methodology of chest/back day, cardio, leg day, cardio, and so on were no longer an effective way to supplement my training. What follows is a sample of my gym workout routine. I certainly acknowledge this might not work for everyone, but it works for me and I believe it has merit to apply to anyone looking to safely expand their physical capabilities while helping their martial arts performance. Spend 5-10 minutes warming your body up. Especially if you are working out first thing in the morning or hitting the gym from being at a desk job all day. It’s important to get the circulation going and wake up your muscles before you ask them to do too much. Light stretching hold each stretch for 20-30 seconds. Notes: the exact warm up exercises aren’t as important as making sure you are limbering up your hamstrings, calves, lower back and neck as these are the most common places to get injured. This is where we get down. This phase should be no less than 20 minutes and no more than 60 depending on your fitness level and the amount of time you have available. During this time we are going to perform a series of circuit drills designed to shift focus from one region of the body to the next between each exercise in rapid succession. The goal here is to promote full body coordination and rapid blood flow between large muscle groups in different areas of the body. Perform each circuit three times transitioning from one exercise to the next as quickly as possible with little or no rest. Rest at the end of each circuit for 30-90 seconds as needed, but no longer as it will get in the way of keeping your heart rate up over time which is key to building endurance. Notes: As for each exercise do as many reps (or for as long) as whatever your personal max effort output for that one exercise is divided by 3. So, for example, if you can do 90 push ups at one time then collapse on your face on the floor, then do 30 pushups for each cycle of Circuit A. The same logic applies to pullups, crunches and well, just about everything here. Run.. Good ol’ fashion run until you’ve expended any energy you have left. This part is where I always blew it in the past. I used to just finish working out and then go hop in my car and go home. That’s bad mmmkay. Take a moment to thoroughly stretch each muscle group you worked holding each stretch for 15-20 seconds. I can’t stress this enough, proper stretching AFTER exercise is just as, if not more, important that the exercise itself. Well, that’s about it. 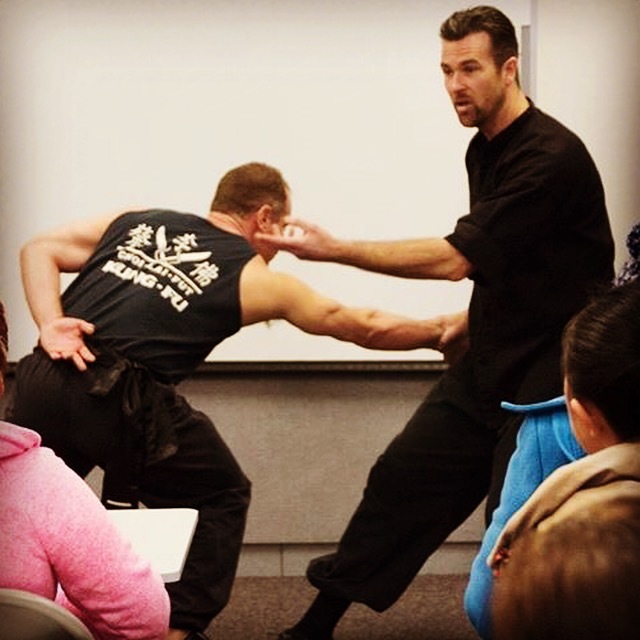 I am grateful to Sifu Nick for allowing me the space to share my thoughts on his blog. It has been somewhat of an epiphany for me and instrumental in recovering from my spinal injury. I hope that in sharing my experiences and what I’ve learned as a result that it may prove helpful to someone someday. Until then. train hard and be awesome. What do I mean by this? The only way you will have the ability to hit with your entire body and power is by conditioning the bones by hitting hard targets. Targets that may be hard physically to move due to their weight and size, as well as targets that have hard surfaces which toughen the bones and the mind to endure the pain. One of the most unique and essential elements to Kung Fu is the iconic iron body conditioning skills. Through years of training and consistent daily practice we turn our bodies into a weapon that is able to deliver a strike or block with full power in order to damage our attacker. Kung Fu focuses on conditioning the fists, hands, arms and legs extensively. In order to block an incoming strike you have to be able to do so with confidence that you can withstand a blow without wavering. The ability to not just block a strike effectively but also inflict extreme pain to the opponent while doing so is also just as important. Conditioning the fists to hit is done by strengthening the wrists and forearm muscles. The wrists must be strong enough to hold firm and straight to keep the proper alignment in the arm and to not buckle. The knuckles are conditioned by striking solid surfaces like canvas bags filled with a progressively harder filling inside. In the beginning stages of this training the bag may be filled with beans or rice, later they can be filled with sand and also rocks. In the advanced stages after the bones have become more dense and strong, you can strike bags filled with iron balls or solid brick or wood blocks. This takes many years and must be done slowly and consistently so you do not damage the nerves and sensitivity. This same type of training is also done on the forearms and shins to develop the bone density and toughness required to strike with and block with. The arms and legs will naturally develop this conditioning over time through steady partner training and sparring. As you practice it is very common to bang your arms and shins to the point of developing large contusions and bone bruises. Kung Fu uses a liniment called Dit Da Jow, or hit fall wine. This is a blend of herbs and alcohol that have been aged. The dit da jow is applied to the bruised areas to properly heal the bones and remove the blood stasis that develops. Many combat sports such as boxing and MMA do not focus on this type of training. In a sport fighting environment the goal is to have the hands wrapped as tightly as possible with padding between and over the knuckles to keep the bones from shifting. This wrapping is firmly tightened all the way down the wrists, even before they put gloves on. Even the gloves themselves are also taped around the outside over the wrist joints. This is all done for the sole purpose of keeping the hands and wrists locked into a fist with the wrists bound tight to not be injured by bending on impact. There is absolutely nothing wrong with this, in fact it’s very smart and has been perfected over many years of sport fighting history. 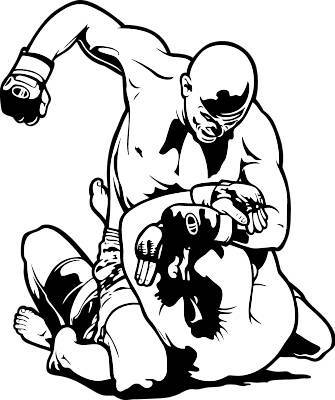 As a fighter gets fatigued it allows them to lay into every punch with as much power as they may have without having to work to maintain the wrists, while supporting the knuckles to last up to 15 rounds in some cases. But this does not develop the type of conditioning that will be needed in a bare knuckle fight for your life. If you throw a punch and break your wrists or bones in your hand, it could cost you your life on the street. The difference between getting hit by someone who has not conditioned the knuckles and someone who has is significant. Just one hit from someone who has spent years hardening their bones can be enough penetrate into the body breaking ribs and damaging organs. In Kung Fu we do not simply hit the skin and muscle on the surface, we aim to do deeper damage into the body. Kung Fu is a complex and sophisticated system of combat. It takes years of diligent and continuous practice to learn. There are no short cuts in Kung Fu. There is a reason for this and a valuable component to the long road of training. When you first learn a single form or technique it is explained in a very exact way for a specific type of use. If you only go to class and do not practice these movements and put in the time to understand them, you will only know what their basic usage is and nothing else. It is only through repetition and and training each movement by yourself and with a partner in application, that you begin to discover that there is an almost endless amount of potential possibilities that a single move may contain. In the intermediate stage of training we have learned how to connect our strikes to our whole body to generate maximum power. The various forms and techniques have built on each other at this point to prepare the student for most possibilities of attacks. During this phase of training there is a larger emphasis on contact, conditioning and partner training. Even though everything students learn from the beginning are applied in a controlled way with a partner to understand application, It is still not full contact free sparring. The basic understanding of an application has to be drilled extensively for the movements to be ingrained in the muscle memory as an instant reaction without thought. Only after building the foundation in a controlled application environment, students will be ready for free fight training. This type of training is used to develop the reaction time and distance required in order to respond correctly to attacks. This is a testing ground for all the movements that have been learned thus far. It’s often hard to apply certain techniques and motions. It’s very common in this stage for a student to feel confident in themselve and ability, but to have a hard time using certain techniques in sparring. They will say, that this or that technique “doesn’t work,” because they feel like if it didn’t work for them, then it doesn’t work at all. this statement couldn’t be further from the truth. This is very common and can be where some students either hinder their ability to further understanding the motions, or they learn to keep seeking how to properly do the technique and understand the potential it has in various situations. There is a lot of analysis and focus on the details rather than just remembering how to do a technique during this stage of training. You can spend hours and months just drilling movements over and over until they expose themselves to the student, in which they develop a deeper ability to see further than just the surface of the art. Nowhere is the skill level of someone more apparent than in the ability they have to control the attacker. Within our style of Choy Lay Fut we have a large emphasis on controlling the attacker using various techniques from trapping and locking the arms and legs, as well as controlling the opponent’s balance and root. Someone who has spent years of training feels a lot different when sparring than someone who is at an intermediate level and only knows how to use the techniques at a surface level. Something my Sifu repeats often to us is, “every counter has a counter.” The meaning behind this statement refers to the basic meaning in which, for every type of attack there is always a counter attack to neutralize it and attack back. There is also a deeper meaning to this statement as well. The only way to learn all the counters to every counter is by continually practicing and studying for many years. It’s not always about who is stronger or faster, but who knows more that may count the most. Learning how to punch, kick and block does not start with the hands and feet like you would expect. So far in the beginning stages the student has mostly focused on their stance, foundation, balance and footwork. More importantly along with these elements the new student has learned to use their hips to generate power in each motion. In order to hit, block or kick, you have to have your basic foundation and proper technique. As you progress in our system of Choy Lay Fut you will start to learn several beginning hand forms. These first few forms are focusing on very simple footwork that the new student can easily grasp while they are learning all the basic hand motions and kicks contained in the forms. In the beginning the motions that you learn are very large swinging punches and blocks. The most famous, and often times recognized as the signature move of Choy Lay Fut, is the Sow Choy. 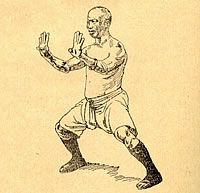 The basic motion of the Sow Choy is similar looking to a a large overhand punch or the motion a baseball pitcher make to use their whole body to throw a baseball. The next motion that is usually connected to learning the Sow Choy is the Kwa Sow. 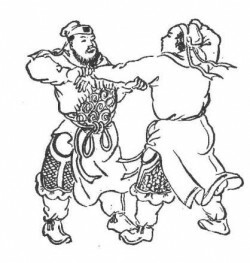 This is a similar motion like the Sow Chow but it uses the back fist swinging down, opposed to the Sow Choy using more of a forward lead swinging motion. Both the Sow Choy and the Kwa Sow are practiced together in the beginning to help the student make the connection from swinging the arms, to using the turning of the hips to swing the arms. Maximum power is only generated this way, not by just moving the arms from the shoulder. Typically we use both motions so often we refer to it as a “Kwa Sow” motion. They flow seamlessly into each other in front of the body creating continuous unbroken striking and blocking attack. The way a new student learns the first motions in Choy Lay Fut is by using large, powerful swings utilizing the whole body. This is done intentionally to help them develop power by using the whole body and not just the arms. This is done in an exaggerated way in order to help students feel the swinging naturally, and to let it whip smoothly. The large swinging motions of the Sow and Kwa are to be relaxed and without tension in the muscles. The best example that helps to understand this relaxed swinging power is by imagining that your arms are ropes with heavy metal balls on the ends. As you swing these balls around you only get the power by whipping them and being fluid and relaxed. The opposing type of power would be similar to swinging a straight metal rod using the arms to swing it. The force and power of the metal rod will be limited by the stiffness and rigidity of it. While the metal ball on the end of a rope can generate much more force from the relaxed momentum and velocity it can generate. Although the Sow Choy may appear to be just a strike it is also a block. You can hit with either the front hand knuckles in what we refer to as a Cup Sow, or by rolling the hand to hit with the big knuckles. This motion can Strike as well as intercept a punch and pull the attacker in to control them. It is a simple motion to learn but can take many years to understand its many uses. But for now at this level the student just needs to focus on learning how to turn the hips, be relaxed and to use the whole body to block and strike with these first basic motions. After years of repetition and application they will discover the sophistication of these motions.